NUEVO JERUSALEM, Peru -- Tomás Maynas Carijano strolled through his tiny jungle farm, pinching leaves, shaking his head. The rain forest spread lushly in all directions -- covering what oil maps call Block 1AB. "Like the trunk of that papaya, the cassava and bananas are also dying," said the spiritual leader of this remote Achuar Indian settlement in Peru's northern Amazon region. "Before Oxy came, the fruits and the plants grew well." Oxy is Occidental Petroleum, the California-based company that pulled a fortune from this rain forest from 1972 to 2000. It is also the company that Maynas and other Achuar leaders now blame for wreaking environmental havoc -- and leaving many of the people here ill. Last spring, U.S. lawyers representing Maynas and 24 other indigenous Peruvians sued Occidental in a Los Angeles court, alleging that, among other offenses, the firm violated industry standards and Peruvian law by dumping toxic wastewater directly into rivers and streams. The company denies liability in the case. For indigenous groups, the Occidental lawsuit is emblematic of a new era. The Amazon region was once even more isolated than it is today, its people largely cut off from environmental defenders in Washington and other world capitals who might have protected their interests. Now, Indians have gained access to tools that level the playing field -- from multinational lawsuits to mapping technologies such as Google Earth. Oil companies that once traded money and development for Indians' blessings are increasingly finding outsiders getting involved. "History has shown that oil companies will cut corners if someone isn't watching," said Gregor MacLennan of Shinai, an internationally funded civic group in Peru. "We try to get to local communities first to help them make informed decisions about oil companies and the changes they bring." Lured by global energy prices, Peru is placing record bets on Amazon energy lodes: Last year the country's concessions agency, PeruPetro, signed a record 24 hydrocarbon contracts with international oil companies. EarthRights International, a nonprofit group that is helping represent the plaintiffs in the Achuar case, says half of Peru's biologically diverse Amazon region has been added to oil maps in the last three years. Occidental pumped 26 percent of Peru's historic oil production from Block 1AB before selling the declining field to Argentina's Pluspetrol in 2000. "We are aware of no credible data of negative community health impacts resulting from Occidental's operations in Peru," Richard Kline, a company spokesman, said in an e-mail statement. Kline said that Occidental has not had operations in Block 1AB in nearly a decade and that Pluspetrol has assumed responsibility for it. Occidental made "extensive efforts" to work with community groups and has a "long-standing commitment and policy to protect the environment and the health and safety of people," he said. The California-based group Amazon Watch has joined the suit as a plaintiff, and the case is now inching through U.S. courts. In a federal hearing scheduled for Feb. 11, company lawyers will ask a judge to send the case to Peru, where Indians say corruption and a case backlog will hurt their chance of winning. The primitive trumpet -- a hollowed cow's horn -- brayed over this gritty river community at sundown. Residents of Nuevo Jerusalem, the Achuar settlement on the Macusari River, trudged up a path, toting shotguns and fishing nets. Some stepped down from palm huts, walking to the meeting in twos and threes. Soon, Lily La Torre was on stage. "I've come to give you news of the Oxy suit," said La Torre, a Peruvian lawyer and activist working with Maynas's legal team. Barefoot women in dirty skirts circled the room, serving bowls of homemade cassava beer. La Torre distilled legal strategies into simple terms. She told villagers that the case had been moved to the federal level in the United States. "Now they are trying to move the lawsuit to Peru," she said in Spanish, pausing for an Achuar interpreter. "But we must pray that the suit stays in the U.S. We know it cannot survive in Peru." Later, as people approached her with questions, a man who was looking on said in broken Spanish: "When Oxy came, we did not know our rights. Now we do." In addition to alleging that Occidental illegally dumped toxic wastewater, the Achuar suit accuses the company of generating acid rain with gas flares, failing to warn Indians of health dangers and improperly storing chemical wastes in unlined pits. The "irresponsible, reckless, immoral and illegal practices" left Maynas and his people with poisoned blood, polluted streams and empty hunting grounds, the suit says. Plaintiffs want damages, declaratory and injunctive relief, restitution and disgorgement of profits. One woman is suing on behalf of her child, whose death she alleges is related to environmental contamination. 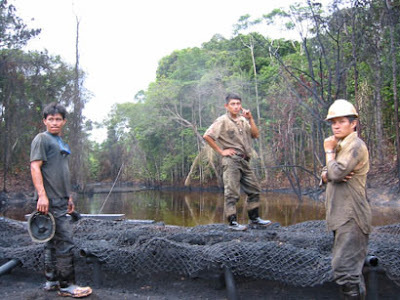 Last spring, before the Achuar case was filed, a team of health experts, lawyers and scientists funded by EarthRights International said in a report that the wells, pipelines and other infrastructure built here by Occidental had directly caused water and soil contamination, which in turn has caused health problems for many local people in Block 1AB. Kline said the report contained "inflammatory misstatements, unfounded allegations and unsupported conclusions" and failed to provide basic information that would help determine whether oil operations contributed to the alleged environmental and health problems. "Nonetheless . . . we will evaluate the claims and the lawsuit and respond accordingly," he said. Environmental groups are going beyond word of mouth and lawsuits to assist indigenous groups. One day last fall, Guevara Sandi Chimboras was bouncing a pickup truck along a remote oil road near the Achuar community of Jose Olaya. Carrying a digital camera, notepad and a Global Positioning System transceiver donated by the civic group Shinai, Sandi walked through a grassy field to a pool of stagnant water. With a stick, he dug up a clump of glistening, pungent mud, and sniffed. "The companies say these sites are clean," he said. "They won't believe us without documented photos. With words, they don't believe us." There are no mass media in the rain forest. But Shinai has translated a U.S.-made documentary about the Achuar's problems into Machiguenga, the language spoken by Indians in southeastern Peru, where a U.S.-backed natural gas project is underway. The group uses DVD players powered by solar panels and generators to show the film to Indians considering agreements with oil companies. Meanwhile, Google Earth is proving to be an omniscient eye. Peter Kostishack, a Colorado-based rights activist, uses the application to record coordinates and satellite images of rain forest erosion and post them on his blog. With help from the U.S.-based Amazon Conservation Team, Indians in Brazil's Amazon Basin have used Google Earth imagery to spot river discoloration caused by illegal mining operations. "Many times a company claims natives don't have the technical knowledge to understand that it is doing the best it can, when in fact it may be doing as little as possible," said Bill Powers, chief engineer of E-Tech International, a nonprofit engineering firm based in California that provides Indians with technical expertise. "We make it a battle of equals, at least in the knowledge area," he said.